I first created a matrix of complex numbers using numpy according to amount of pixels. I also created an array for the image generation. Then I check whether each complex number is in the mandelbrot set or not and give it an RGB colour code accordingly. Finally I generate the image using the PIL library. I am using jupyter notebook and python 3. Hopefully some of you can help me improve the performance of this program or other aspects of it. I'm going to reuse some parts of the answer I recently posted here on Code Review. (Most) loops are damn slow in Python. Especially multiple nested loops. NumPy can help to vectorize your code, i.e. in this case that more of the looping is done in the C backend instead of in the Python interpreter. I would highly recommend to have a listen to the talk Losing your Loops: Fast Numerical Computing with NumPy by Jake VanderPlas. All those loops used to generate the complex grid followed by the nested loops used to iterate over the grid and the image are slow when left to the Python interpreter. Fortunately, NumPy can take quite a lot of this burden off of you. No loops, just plain simple NumPy. which is just a single loop instead of three nested ones. Here, a little more trickery was needed to treat the break case the same way as you did. elements_todo is used to only compute updates on the z value if it has not been marked as done. There might also be a better solution without this. to validate my results against your reference implementation. An aspect I somehow slightly ignored while looking at your code was that you're essentially creating a grayscale image since all of your color channel values are the same. Accounting for this, you can easily reduce the size of data the program has handle to from, in your case, 3000x2000x3 to 3000x2000. This will likely help your program to be more cache efficient, although I'm not an expert in this field. A quick implementation of Reinderien's hint towards the symmetry of the Mandelbrot set will again add a factor of about two to that. However, my quick hacking approach did not lead to an output that was completely within the tolerance of np.allclose compared to the original one. Funnily, it seems to be off by one at a single pixel, but visually still the same. Since this post is already quite long, I will leave the reimplementation as an exercise to the reader. Depending on your needs, you might also go down with the floating point precision from 64bit to 32bit on addition to all the previously mentioned optimizations. This will cover performance, as well as Python style. You currently have the magic numbers 2000 and 3000, the resolution of your image. Save these to variables perhaps named X, Y or W, H.
You don't just rely on Python 3 and Jupyter - you rely on numpy and pillow. These should go in a requirements.txt if you don't already have one. At all. complex_number should be formed dynamically in the loop based on range expressions. Disclaimer: if you're vectorizing (which you should do), then the opposite applies - you would keep your complex grid, and lose some loops. You're using index to get your coordinates. Don't do this - form the coordinates in your loops, as well. Notice that it's mirror-imaged. This means you can halve your computation time and save every pixel to the top and bottom half. In a bit I'll show some example code accommodating all of the suggestions above. Just do (nearly) what @Alex says and I'd gotten halfway through implementing, with one difference: accommodate the symmetry optimization I described. These can be combined with the Python-specific optimisations from the other answers. Any points that get further than 2 from the origin will continue to escape towards infinity. So it isn't important whether you check that a point has gone outside a circle of radius 2, or that it has gone outside some other finite shape that fully contains that circle. For example, checking that the point is outside a square instead of a circle avoids having to square the real and imaginary parts. It also means you will need slightly more iterations, but very few and this should be outweighed by having each iteration faster. The exception to this suggestion is if the circle is important to your output. If you simply plot points inside the set as black, and points outside the set as white, then the image will be identical with either approach. However, if you count the number of iterations a point takes to escape and use this to determine the colour of points outside the set, then the shape of the stripes of colour will be different with a square boundary than with a circular boundary. The interior of the set will be identical, but the colours outside will be arranged in different shapes. In your example image, not much is visible of the stripes of colour, with most of the exterior and interior being black. In this case I doubt there would be a significant difference in appearance using this optimisation. However, if you change to displaying wider stripes in future, this optimisation may need to be removed (depending on what appearance you want). The interior of the set takes far longer to calculate than the exterior. Each pixel in the interior takes a guaranteed 255 iterations (or more if you increase the maximum iterations for even higher quality images), whereas each pixel in the exterior takes less than this. The vast majority of the exterior pixels take only a few iterations. If you want the code to be adaptable for zooming in to arbitrary positions, then you won't know in advance which parts of the image are going to be interior points. However, if you only want this code to generate this one image of the whole set, then you can get a significant improvement in speed by avoiding calculating pixels you know are interior. For example, if you check whether the pixel is in the main cardioid or one of the large circles, you can assign all those pixels an iteration count of 255 without actually doing any iteration. The more you increase the maximum iterations, the more circles it will be worthwhile excluding in advance, as the difference in calculation time between the average exterior pixel and the average interior pixel will continue to diverge dramatically. I don't know the exact centres and radii of these circles, or an exact equation for the cardioid, but rough estimates that are chosen to not overlap the exterior will still make a big difference to the speed. Even excluding some squares chosen by eye that are entirely in the interior would help. Using numpy to calculate the Mandelbrot set is not really a good fit because the same data will be stored and loaded from and to memory repeatedly, thrashing the cache. A better option would be to use a jit compiler to accelerate the critical code path, for example numba jit. In this case, 4 characters can make the function run 200 times faster. With the function annotation @jit this code runs in 2 seconds instead of 400 seconds at 3000x2000 resolution, without any special tricks. So I'll say this: optimize the heck out of stuff that will be running many iterations. Forget about clean-code or nice OOP principles. For lots-of-iterations stuff like this, you want as nitty gritty as possible. Imagine what's happening behind the scenes in memory with just that very first line. You've got an instance of a complex number. You want to square it... so it has to create another instance of a complex object to hold the squared value. Then, you're adding another complex number to it - which means you're creating another instance of Complex to hold the result of the addition. You're creating object instances left and right, and you're doing it on an order of 3000 x 2000 x 255 times. Creating several class instances doesn't sound like much, but when you're doing it a billion times, it kinda drags things down. No objects are getting created and destroyed. It's boiled down to be as efficient as possible. It's not as nice looking... but when you're doing something a billion times, shaving off even a millionth of a second results in saving 15 minutes. And as someone else mentioned, you want to simplify the logic so that you don't have to do the square-root operation - and if you're okay with small variations in how the gradient is colored, changing the "magnitude" check with "are x or y within a bounding box". Aka, the more things you can remove out of that runs-a-billion-times loop, the better off you'll be. 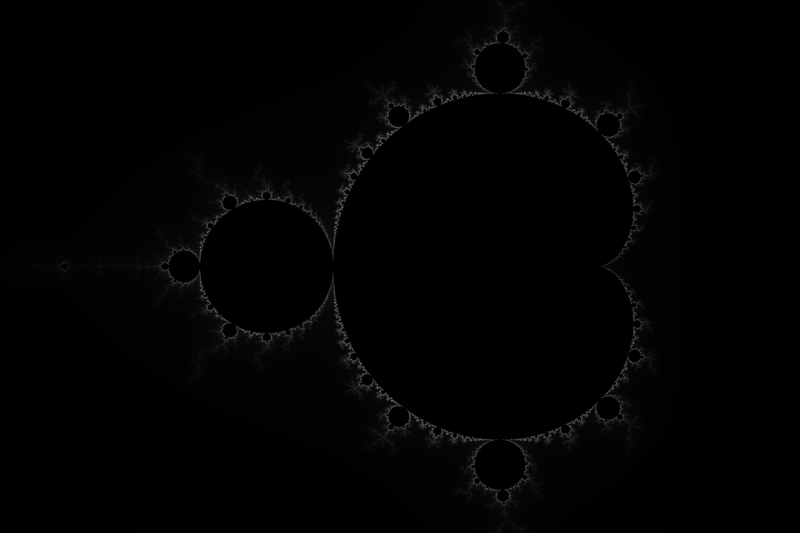 There are a few tricks you can use to make a Mandelbrot renderer really fly. 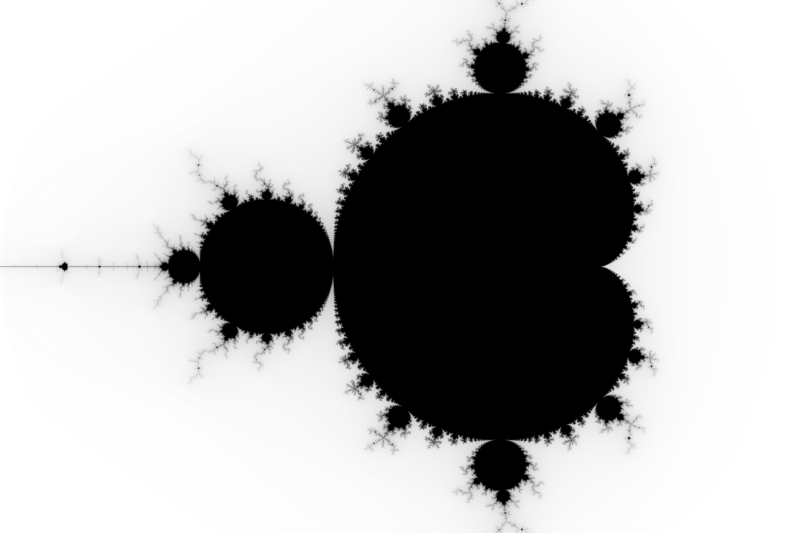 If a point lies inside the Mandelbrot set, successive iterations will cause it to decay into a cycle. The most economical way to detect this, I have found, is to do x iterations, test to see if it is the same as before, then increment x and repeat. That's a 1000x1500 image in your case. Calculate it such that each pixel represents a pixel in the real image. Then if a pixel is entirely surrounded by other pixels with the same iteration count, you can assume that it also has that iteration count and skip calculating it. This technique can miss fine strands, but it saves an enormous amount of time. You should also use a flood fill style algorithm whenever you calculate an unskippable pixel to find other pixels that may previously have been considered skippable but aren't. This should fix most of the problems. Also note that this is recursive. Before calculating the 1000x1500 version you should calculate a 500x750 version, before that a 250x375 version etc. If you want to calculate deep fractals, you need to use high precision, which can be a huge drain on calculation time. However, strictly speaking you only need to use high precision for one pixel. This is a bit more complicated, but we only need to use double precision numbers, so it is much, much faster when deep zooming. One issue is that the \$p\$ sequence has to be at least as long as the \$q\$ sequence, and we cannot tell the best \$p\$ sequence in advance. In practice we often have to calculate new \$p\$ sequences using high precision arithmetic as we discover pixels with a longer escape time. There is no getting around it, Python is slow. NumPy can do the heavy lifting, which can speed it up dramatically, but it's pretty awkward compared to the same code written in C. I suggest learning to use Ctypes and writing a small C library to follow the iterative formula. For much more optimization, you might dig into the source for Fractint. It was written in the late '80s/early '90s for hardware that was thousands of times slower than modern CPUs (but could generate the image you generated in less than a minute, in 640x480 tiles, of course). One of the "big deals" with FractInt was that most of the implementation uses integer math to implement fixed-point arithmetic (a much bigger deal when floating point was either emulated by slow-ish libraries or by means of optional, expensive, external chips (see Intel 8087 through 80387)). Another area of improvement : divide the image into squares. Since the Mandelbrot set is connected, if a square has no point of the set on its boundary, it has no point of the set in its interior. This leads to edge-following as a strategy to vastly reduce the number of pixels that must actually be calculated. Source as well as MS-DOS and Win 3.x executables are still available. Not the answer you're looking for? Browse other questions tagged python performance python-3.x image fractals or ask your own question.